Though I continued to study about money and finances on a weekly basis, I noticed last week that I haven’t published an article on the subject for quite a long time. 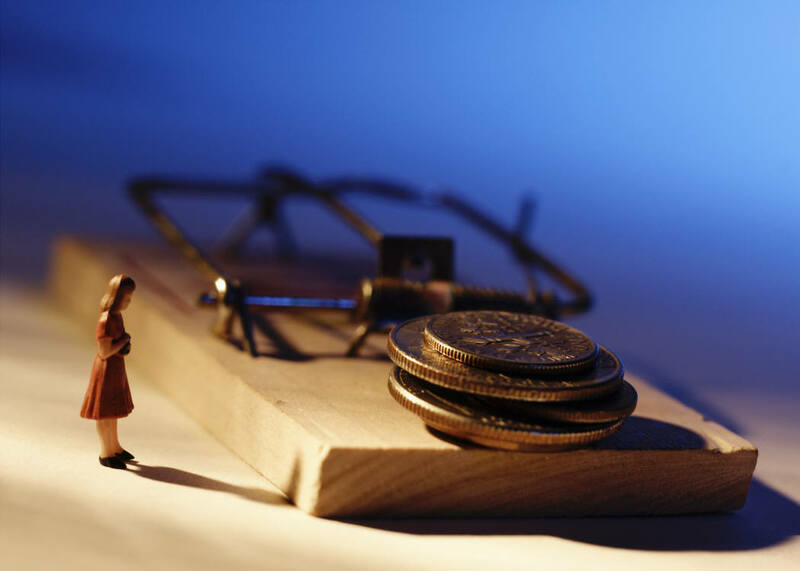 Today, I want to make a comeback by sharing with you 12 financial traps that we should all avoid if we want to become (or remain) financially free. I’ve learned these from Tony Robbins’ course, appropriately entitled “Get the Edge: A 7-Day Program To Transform Your Life ,” which is genuinely one of the most amazing materials that I have ever invested in! On day 6 of this 7-day course, Tony talks about “Creating the Foundation for Lasting Wealth.” I was already fairly familiar with most of the concepts he presented, but the below list was entirely new information, and I think essential to financial freedom. 1. They never define what wealth means to them. This is clearer than sunshine. You cannot hit a target that you cannot see. If I go out on the street now and start asking people “When do you know that you you’re wealthy?” about 99 responses out of every 100 will be vague in nature. “I won’t need to work anymore!”, “I can buy whatever I want!”, the classic “When I have a million dollars in my account!” or any other variation you can think of will pop-up. Close to no one has taken the time to sit down and figure out an exact number that they need in order to become financially free, so any reasonable plan to get there is out of the question! I will most probably write an article on how to calculate the exact number you need, but today I still have 11 other financial traps to talk about! 2. They make wealth a moving target. Let’s say that you put a realistic number on what financial freedom means to you, but then when you reach it, you realize that your expenses have increased so now you need even more money! Making wealth a moving target makes the financial game unwinnable. The truth is that there are several states of where you can be financially and they are different for anyone. For example, a Romanian earning $3000 per month might live like a king (or queen), but a New York citizen living in the middle of the city could barely afford to pay for rent! So it’s clear that everyone should know when *their* numbers. 3. They define wealth in ways that make it impossible to achieve. I’m one of the most minimalistic people I’ve ever met. I don’t really like owning things. I prefer experiences. Instead of owning an island, which costs a fortune both to purchase and to maintain, I would rather just rent it for a few weeks and enjoy all the benefits, without the extra hassle. When most people think of wealth, their mind goes: Yacht, Villa, Island, Millions, Ferrari and so on. They think of wealth as a far, far away place that only the “more fortunate” get to enjoy. Don’t go there. Instead, define wealth on your own terms. I personally do not need a private helicopter, First/Business class is more than enough for me, thanks. Don’t get sucked into mass media. It’s your life, so start making decisions according to your own standards, not someone else’s. 4. They never even start. Working like you have a lifetime and spending like there’s no tomorrow are obviously not going to serve you, in the long term. At least not if financial freedom is one of your goals. Yes, you might have that new phone or shiny car or an even bigger house, but you’re really just playing the game that the guys in the marketing department from those companies want you to play. And guess what? Statistically speaking, we’re losing. Stop being a consumer and start thinking like the wealthy. Decide on your number, make a measurable plan and then go for it! 5. They never make wealth an absolute must. What’s your opinion? Would it be *nice* to be wealthy, or is it an absolute *must* for you? We take *very* different decisions when we are committed to something or someone. Don’t believe me? Just look at a new couple, how they love and take care of each other without expecting anything in return. And then turn around and look at a couple that’s on the point of breaking up. I’m sure you know the difference. The decisions they make regarding what they say or do are very different. So, are you truly committed to attaining wealth, or is it still in the “Nice to have” category for you? 6. They don’t have a realistic plan. You don’t need to be the owner of a multinational corporation to be wealthy. You just need to spend less than you earn and invest the difference. Decide on yearly, monthly and weekly budgets, have a clear action plan on adding more value to your current company or getting a better job and so on. Even if, by your calculations, you reach financial freedom in 20 years, it’s still *much* better than 95% of the population that never get there in the first place. Think about that for a second. 7. They fail to follow through. Don’t be a tactician, be a strategist. A tactician makes a plan and then starts following it, whereas a strategist makes a plan, thinks about the challenges that might arise, figures out a few solutions and only then gets his/her hands dirty. Don’t let something as fragile as “chance” or “luck” guide your way! The quality of *your* life depends on *you*! You can either find excuses or solutions, but you can’t do both. Which path will *you* take? 8. They make “experts” responsible for their decisions. Most brokers do not have the experience nor the tools they need to take the best decisions on your behalf. On top of that, if they lose your money, it’s your loss, not theirs. If you’re thinking “Well that may be true, but I don’t have time to learn how to invest.” Fair enough, but do you have a *lifetime of hard-earned money* to spend on someone else’s learning experience? I don’t know about you, but I sure don’t. I’d rather just invest a few dollars in a great book and learn all of the strategies that the wealthy use to continuously grow, with minimum to no risk. 9. When faced with major challenges, they give up. Unexpected things can and *will* happen! The best thing you can do is to have a backup plan for whatever you *think* could happen and then adapt to what *really* happens. What happens if you lose your job? What if you break a leg? What if you need to move to another city or even country? What if you find the love of your life? Or if you already have, remember, being a parent isn’t just a full time job, it’s also the second most important investment of your life! 10. They fail to conduct life as if it were a business. Can you show me your balance sheet? What about your Profit/Loss statement? What’s your year-over-year increase in revenues? On what day of the month do you break even? What’s your strategy to increase profitability? Do you ever ask these questions in your personal life? I’ll take a wild guess and say that you probably don’t. I know I didn’t until two years ago. Your life is your business and the success of it depends on your ability to manage it. 11. They allow other people’s emotions to affect the implementation of their plan. I’m not saying that they’re lying, but in most cases, impulses and urges should be controlled when spending. Get yourself the gadget if you feel you can’t live without it, or invest in what you believe in, but please: Give yourself a few days to think about it! Study the offer, think of the pros and cons, ask questions like “If I buy that, how will it affect my life?” or “What *else* could I buy with that money?”and so on. Become well informed before you make any purchase and you’ll be just fine. 12. They never really get quality coaching. If you’re like most people, money management isn’t actually your specialty. You work, you spend time with friends, you indulge in a hobby and a dozen other things, but who’s keeping an eye on the financials? Typically, no one. That’s the problem, but that’s also why the practice of coaching became so widely accepted. A coach is a person that specializes in one or more specific areas that you want to get under control or even master. I know much more about money than most people, but I still have a coach to keep me on track. I know how to run a business, but it’s always good to have a partner. I know how to lift weights, but a coach pushes me to do more, to try harder! My only suggestion when investing in a coach (or the products from one) is to make sure that you have a moneyback guarantee. If they don’t trust in their abilities enough to provide a guarantee, then why should you? Also, the last thing I want to say is that if you believe that you cannot afford a coach, then invest in a book or course. The medium through which you learn and grow is much less important than the growth itself. I personally learned about the above list (and a hundred other things) from Tony’s course and not from meeting or talking to him in person. You can do the same for any part of your life, just go for it. That’s about it for me today. I hope you liked this (long) article and that it will help you on your journey to financial freedom! As always, if you have any questions, feel free to ask! The best investment opportunity ever!